Organic flowing Art Nouveau glass is some of the most stunning glass ever made. Glass was a natural medium for art nouveau artists to use and the organic flowing decoration was well suited to how glass was worked. 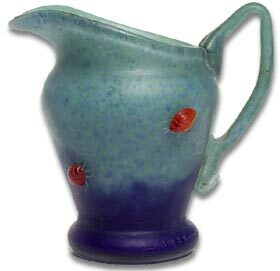 Popular since the 1890’s and 1900’s and produced by excellent Art Nouveau designers like Tiffany, Daum, Leotz and Orivit. The Art Nouveau style lasted until the first world war in Europe in 1914. It used free flowing motifs based on shapes and forms found in nature. Think of a sensuous line: of a flowing line: a line which bends and turns back on itself. Think of the feminine form, rounded and curving. Think of plant forms growing and burgeoning. Think of flowers in bud, in over-blown blossom, as seed pods. Think of … waves, think of a women’s hair, think of twisting smoke. Particularly collectable artists include Emile Galle, Louis C. Tiffany, the Daum brothers at Daum Nancy, Muller Freres, Loetz, and the Powells at Whitefriars and many others. In Germany the style is called Jugenstil and in Italy Floreal or Liberty. In Austria it is called Secessionstil and in France it was often called Modern Style. The name Art Nouveau is derived from a Paris gallery called ‘Maison de L’Art Nouveau’, which played a major role in displaying and popularising the style. Art Nouveau was in part a reaction to the Victorian passion for imitating earlier styles like Classical and Renaissance, Baroque and Rococo. Imitations of works of art from the past seemed to give the Victorians a sense of security and confidence in their own affluence. Art Nouveau was something fresh, entirely new, and a break-away from the old traditions. It was also in part a reaction to the perceived ugliness and despair of the machine age; art nouveau was a blaze of invention, fantasy and audacity. 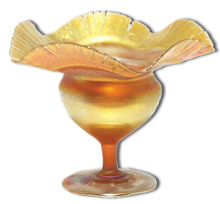 Start your Art Nouveau Glass collection by flicking though our Art Nouveau Glass for Sale section. Proficient designers of Art Nouveau glass produced truly beautiful pieces that can fetch considerable sums when they appear at auction. 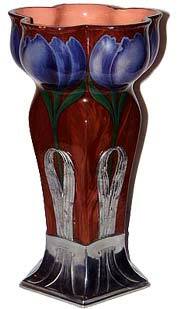 An Art Nouveau glass vase in the manner of Loetz. Clear base glass with satin iridescent finish. Applied pull lines marvered into the surface in a feathered design. Ground and polished pontil and wide wavy rim. The iridescent finish with petrol blue tones. c1900. 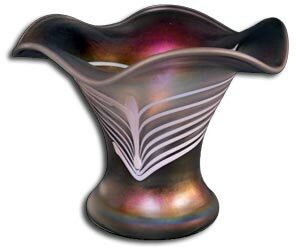 A beautiful orivit art nouveau vase of superior quality and superb color. Great quality Art Nouveau pieces are rarely seen and the glass collector would be well advised to grab them when they do find them.